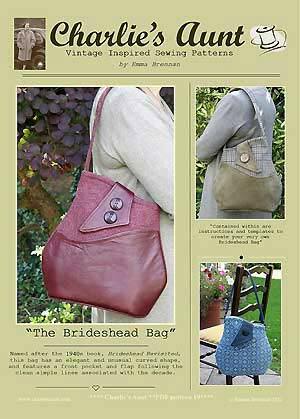 The Brideshead Bag Pattern is a unique handbag pattern with a stylishly designed curved front that is shown off by contrasting fabrics! 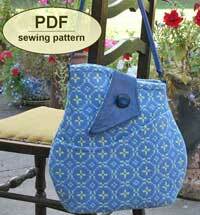 The Brideshead Bag pattern is very unique with an elegant curved shape, convenient front pocket and flap, and instructions for an interior pocket. 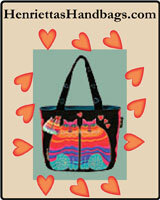 This chic bag is made with contrasting fabrics that accent the bag's stylish curve design and it's retro inspired look. 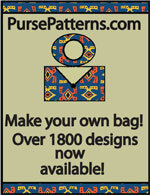 Finished size is 14"H x 14"W x 3 1/2"D.
This PDF pattern has 17 pages total of which 9 pages include photographs, detailed step-by-step instructions and illustrations, plus 8 pages of full sized pattern templates. All templates are actual size but most of the pieces are too big to fit on one sheet so you will have to tape them together after you have cut them out.